I loved Eat, Pray, Love, and have read it three times, of course for the pasta and the yoga and Bali, but more because of the compelling personal journey of a woman trying to figure out how to be happy and how to live, through travel. 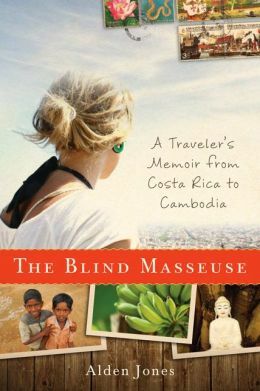 If there is any justice, I hope that all the many people who loved that book will discover and love The Blind Masseuse, A Traveler’s Memoir from Costa Rica to Cambodia, by Alden Jones, which will be published in November from the University of Wisconsin Press (now available to pre-order). I devoured the book in nearly one sitting, gripped from the first line, when the narrator, walking home at night in the pitch-black in her homestay village in Costa Rica, bumps into a cow, and can’t, for a moment, assimilate what’s happening. Jones’s book is not a memoir of a divorce or a failed love affair like Gilbert’s (though there are love affairs), it’s a chronicle of her own itchy-feet syndrome, of why a recent graduate from a good college found it impossible to settle down into “ordinary life,” and instead spent the next decade-plus as a student tour-guide, volunteer English teacher, and every other hook-and-crook that could get her elsewhere. Jones uses that moment with the cow—and that type of rare, disorienting moment in general—as a metaphor for the delights of travel. Seeing something new and surprising, even deeply so, is a unique buzz, and is one of the many reasons why we leave home, maybe the reason. Who are we when we travel for the thrill of it? Who does it affects and how? What are the moral, ethical and spiritual dimensions? These are questions that everyone who considers themselves a ‘traveler’ rather than a ‘tourist’ has probably asked. Jones’s answers are entertaining, gritty, page-turning, and light-handedly profound. Also, she’s hilarious, and the book is hilarious, and a joy to read. She can tell you about getting a massage from a blind man at a spa in Costa Rica (true story, the inspiration for the book’s title), and reveal his chronicling of her physical attributes and flaws with perfect offhanded aplomb, while using the experience as a powerful, layered metaphor. The blind man tells her that blond hair and blue eyes are better, and that she needs to lose weight—“seeing,” just like the traveler groping along unfamiliar terrain, mostly what he expects to see. Smarts aside, the book is also a vivid and thrilling chronicle of adventure in rural Costa Rica, Fidel’s Cuba, strike-torn Bolivia, and, perhaps most exotic of all, a cruise ship’s “Semester at Sea,” all with joy and weirdness in equal measure. So it’s bittersweet when the author does, eventually, settle down, accompanied by realization that her lifestyle, by definition, cannot be permanent.